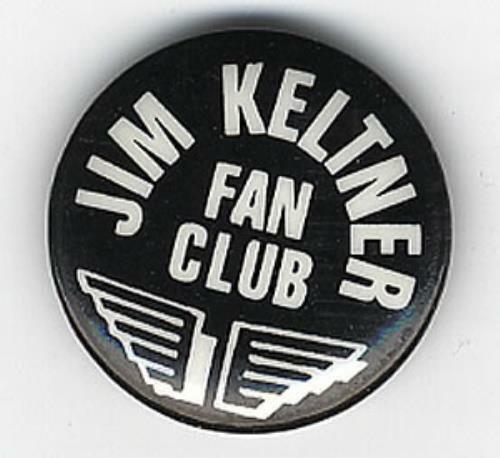 THE JIM KELTNER FAN CLUB The Jim Keltner Fan Club (Great oddity from the world of Beatles - a black circular pin badge measuring approx 1" in diameter with the title text printed in white, with a 'Wings' type symbol below. The 'fan club' was a joke that George Harrison came up with and has been used in various solo Beatles project. See 'more info' for some examples of where this joke has cropped up....). "Jim Keltner fan club - For all information send a stamped undressed elephant to 5112, Hollywood Boulevard, Hollywood, California." George then had these pin badges made in very limited quantities and distributed them during his tours during the seventies. The Jim Keltner Fan Club is also credited on Ringos 'Ringo' album and a pin badge similar to this was issued in a special promotional only box set of which only 75 copies exist. Ringo distributed these box sets to friends and family. Jim has worked with John Lennon, George Harrison & Ringo Starr.